Anti-anxiety medications may have there place as a temporary fix, but it is important to understand that medications will not address the underlying cause of your anxiety, which is primarily psychological. Mindfulness Therapy provides a highly effective way of changing those underlying psychological habits that cause anxiety disorders and other forms of emotional suffering. Welcome. My name is Peter Strong. I’m a professional psychotherapist and I specialize in a system of psychotherapy that I developed several years ago now, called Mindfulness Therapy. So if you’re looking for an online therapist to help you overcome anxiety without using medication then I invite you to take a look at my website and then e-mail me if you’d like to ask any questions and also to schedule an online therapy session with me if this interests you. Most people really enjoy the convenience of online therapy. And people are always looking for alternatives to medication. Medication may have its place but it’s really important that you understand that medications cannot change the underlying cause of your anxiety or panic attacks. The underlying cause of anxiety, and I would say this applies to depression as well, his psychological in nature. It is primarily a subjective psychological habit that becomes established and is rapidly and easily activated by stimuli, certain factors either external factors or internal factors such as thoughts and beliefs. But the mechanism that generates the anxiety is psychological and is basically a habit. I call this the “anxiety habit” and the anxiety habit can be changed. The most important way to change any habit is to bring more conscious awareness to it. This of course is a primary feature of Mindfulness Therapy. Mindfulness is all about developing more conscious awareness around the thoughts and emotional reactions of the mind. It’s learning to see them clearly without becoming blindly attached to them, blindly identified with them, so that you become a victim of your thoughts or beliefs or other emotional reactions that may be activated in your mind. We want to become free from the mind, basically. We want to be free from its contents. We don’t want to be controlled by habitual emotional or cognitive reactions. So developing this freedom from content of mind is a central feature of the system of mindfulness therapy that I have been working on, and it is very, very effective indeed. 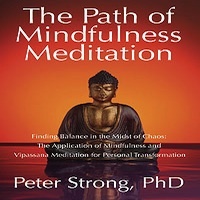 And most people see substantial changes within a very short time, usually no more than a few weeks once you start applying the mindfulness methods and mindfulness meditation techniques that I teach. We have to stop running away from our habitual emotional and cognitive reactions. We need to turn things around, and this means we actually learn to meditate on the mind. This is the definition of mindfulness meditation. It is not about trying to escape the mind or divert the mind onto the breath or other more positive or neutral objects. The purpose of mindfulness meditation is to meditate on the mind and liberate yourself from those habits that cause suffering. So if you’d like to learn more about this approach and you are motivated to overcome your anxiety without medication, then please email me and let’s schedule a trial psychotherapy session. I see clients all over North America and Western Europe and the UK and as far away as Australia and Japan. All you need is an internet connection and we can schedule a Skype Therapy session at a time that works for both of us. So if you would like to get started and you would really like to make significant changes in your anxiety, then please contact me now. The most effective way to overcome anxiety and depression is to break free from the underlying habitual reactive thinking that fuels your anxiety or depression. This is precisely what we focus on during online therapy sessions. This is a very effective approach and most people see significant improvements after 2-3 sessions. Medications only provide temporary relief from the symptoms, but do not change the underlying cause; Mindfulness Therapy does change the underlying process that causes anxiety and depression and that is why it is so effective for producing lasting changes. The treatment of anxiety typically involves the prescription of medications, but that only treats the symptoms of anxiety or panic attacks, it does not treat the underlying cause, and that’s what I try to address in these online therapy sessions that I provide via Skype. You need to change the pattern of reactive thinking that fuels the anxiety process, and this is what we work on during mindfulness therapy online. You have to learn how to actually embrace your thoughts and emotions using mindfulness. If you react to your thoughts or emotions with some form of aversion or avoidance, that will simply make the anxiety stronger. What really works is when you learn to embrace your anxiety with conscious awareness and a quality of friendship that comes along with that conscious awareness. This really starts the process of change. Mindfulness is the combination of conscious awareness and friendliness (called metta in Buddhist psychology) and it is now well established that this combination is what is most effective for healing unresolved emotions. During mindfulness training, you effectively become like a parent to your anxiety and other emotions, helping them heal and resolve. Once this healing process (called a Resolution Pathway in Mindfulness psychotherapy) is established through practice it become a habit: a habit that automatically resolves anxiety rather than the older reactive habits that fed the anxiety and prevented it from healing. Eventually, you cease to feel anxious. This approach works and is far superior to using prescription drugs for treating anxiety. So, please, if you would like to learn more about how to overcome anxiety without the use of medications, or without endless sessions of counseling and talk therapy, please contact me and let’s discuss this in more detail. Thank you! Old style counseling can be beneficial, but often it does not change the underlying psychological process that is the real cause of your anxiety and depression. The same can be said for medications – the anti-anxiety medication may relieve symptoms for a while, but medications are not effective for transforming the underlying process that generates the emotional suffering. The school of psychotherapy that I teach online is called Mindfulness Therapy, which can be very powerful for managing all forms of anxiety and for treating depression or other common psychological problems caused by conditioned reactive thinking. Most people notice dramatic improvements after the first few sessions of Mindfulness-based Skype Therapy. Go to my website and contact me to discover more about this online psychotherapy service and to arrange for a therapy session with me. This Skype counseling therapy service is available world-wide, including the USA, UK and Europe. All you need is a good internet connection and you are ready to start online therapy. It’s extremely important that you simply learn how to, basically, meditate on your emotions, on your anxiety and depression. You’ve got to from a friendly relationship with your emotions. Most of us, of course, react to our anxiety, depression or other disagreeable emotions with avoidance and some form of avoidance to those disagreeable emotions. We don’t like these unpleasant feelings and we attempt to get rid of them. That is actually the worst thing you can possibly do, because this kind of reactivity makes the anxiety or depression grow and become stronger. Any kind of reactivity has the negative effect of reinforcing the anxiety or depression. What I have found, and lots of others in the field of Mindfulness Therapy have found, is that what actually creates change and transformation is when we are able to hold the emotion in our conscious awareness without negatively reacting to our painful emotions with avoidance and aversion. When you are doing that you are learning how to effectively be with the emotion without becoming reactive and without becoming overwhelmed by it. This teaches the mind a totally different manner of processing that the anxiety, which allows the emotion to change, to heal itself and also to transform itself. Therefore, if you are interested in online therapy, do please visit my website and e-mail me and then we will be able to explore further whether this form of mindfulness-based psychotherapy is appropriate for you. Please, see my website and e-mail me.